This is a question that we get asked every day from pet owners that are new to the concept of raw food for dogs and cats. They expect normal bowel movements when feeding dogs raw meat so when either diarrhea or constipation occur, they become alarmed that their dog might be having a major problem. Let me first clear up a common misconception, and that is, that it is not normal for your pet to have a consistently well-formed stool every single day of a their life. It sounds strange to say, but there is a reason why your pet’s stool cannot be uniformly predictable. Your dog and your cat will receive a variety of food, treats, bones, and perhaps table scraps each and every day, which means that each meal will have a slight variation of ingredients. 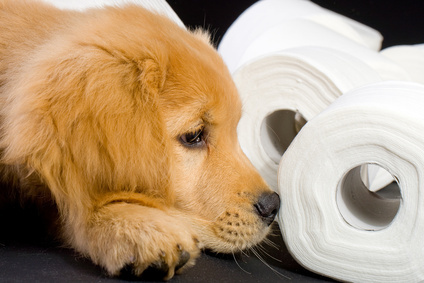 There are other factors that may affect your pet’s digestion process, such as stress, medications, exercise, and illness. Each of these factors affect the gastrointestinal (GI) tract which can result in either diarrhea, vomiting, or constipation. And yes, it’s true that a dog that is fed exactly the same food every day of her life, that has never been fed off the table, is never given treats of any kind, never allowed to scrounge around outside and snack on things she shouldn’t, and is so healthy that she is never given medication, can be the perfect specimen for having a healthy, well-formed stool every day. But as we pet owners all know, having a dog this perfect is not as easy to come by as we would like. BARF World’s philosophy of how to properly feed a dog is based on Mother Nature’s most appropriate food for the species. A dog’s natural diet is made up of bones and raw food (BARF), which are found in the prey they catch or in the dead carcasses they may stumble upon. First, if giving your pet raw meaty bones as a yummy chew, reduce the amount of bones to once week. Another quick and easy solution is to add some extra fruit to your pet’s meal. This is a well accepted way to temporarily regulate the bowels. Canned unsweetened pumpkin can also help to ease straining. Finally, if that doesn’t resolve the issue, try Nux Vom, a homeopathic remedy great for pets and people that helps relieve symptoms of nausea and indigestion, vomiting, and (of course) constipation. It is interesting to observe and compare the difference in stool volume, color, and odor of dogs fed raw food as compared to those fed dry dog food (kibble) or canned pet food. The difference in the animal’s utilization of nutrients in each diet is obvious when you immediately notice that the dog fed raw food has 25 to 30% less stool volume than the dog fed processed pet food. This indicates a more efficient utilization of ingredients from a raw dog food diet. The raw diet produces a chalky white stool that is consistently smaller in volume and has almost no odor. These improvements are welcomed advantages for dog and cat owners, especially those with large and giant breed dogs. Robert Mueller, BSc, Pharm. is a registered pharmacist, author of “Living Enzymes: The World’s Best Kept Pet Food Secret”, and co-developer of BARF World’s BARF diets patties, nuggets and supplements – the first company to make the Biologically Appropriate Raw Foods (BARF) diet conveniently available to animals everywhere. He and his wife love to travel around the world with their dog, Moxie – a Yorkshire Terrier/Maltese mix. For more articles like these and to learn more about the benefits of raw food for your pets, sign up for “The Intelligent Pet” monthly e-zine at The Intelligent Pet. reliable advice in this blog.